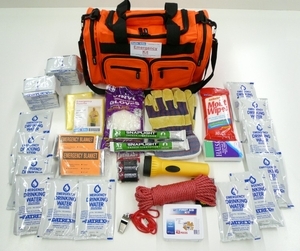 This 2 Person ESSENTIALS Disaster Kit comes in a high quality bag and will sustain two persons for 3 days (72 hours) in the event of a disaster or emergency. This 2 Person 72 Hour Survival Kit is the ideal kit to get you on your way to reach your disaster preparedness goals. At 15 inches, this high quality duffel bag is large enough to leave room in the exterior pockets for items you might want to add to this disaster kit.